1. 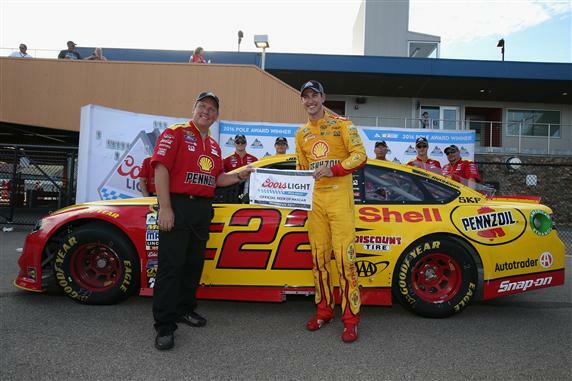 (22) Joey Logano, Ford, 201.698 mph. 2. (48) Jimmie Johnson, Chevrolet, 201.523 mph. 3. (11) Denny Hamlin, Toyota, 201.416 mph. 4. (4) Kevin Harvick, Chevrolet, 201.382 mph. 5. (24) Chase Elliott #, Chevrolet, 201.303 mph. 6. (88) Alex Bowman(i), Chevrolet, 201.207 mph. 7. (21) Ryan Blaney #, Ford, 201.202 mph. 8. (1) Jamie McMurray, Chevrolet, 201.039 mph. 9. (19) Carl Edwards, Toyota, 201.005 mph. 10. (31) Ryan Newman, Chevrolet, 200.462 mph. 11. (5) Kasey Kahne, Chevrolet, 200.028 mph. 12. (42) Kyle Larson, Chevrolet, 199.341 mph. 13. (20) Matt Kenseth, Toyota, 200.390 mph. 14. (78) Martin Truex Jr, Toyota, 200.356 mph. 15. (14) Tony Stewart, Chevrolet, 200.323 mph. 16. (18) Kyle Busch, Toyota, 200.245 mph. 17. (3) Austin Dillon, Chevrolet, 200.106 mph. 18. (2) Brad Keselowski, Ford, 200.017 mph. 19. (41) Kurt Busch, Chevrolet, 199.253 mph. 20. (27) Paul Menard, Chevrolet, 199.203 mph. 21. (34) Chris Buescher #, Ford, 198.912 mph. 22. (16) Greg Biffle, Ford, 198.791 mph. 23. (10) Danica Patrick, Chevrolet, 198.747 mph. 24. (6) Trevor Bayne, Ford, 198.183 mph. 25. (47) AJ Allmendinger, Chevrolet, 198.265 mph. 26. (43) Aric Almirola, Ford, 198.178 mph. 27. (15) Clint Bowyer, Chevrolet, 198.129 mph. 28. (13) Casey Mears, Chevrolet, 197.553 mph. 29. (17) Ricky Stenhouse Jr, Ford, 197.509 mph. 30. (44) Brian Scott #, Ford, 196.105 mph. 31. (7) Regan Smith, Chevrolet, 196.084 mph. 32. (23) David Ragan, Toyota, 196.057 mph. 33. (38) Landon Cassill, Ford, 195.567 mph. 34. (83) Matt DiBenedetto, Toyota, 195.159 mph. 35. (95) Sam Hornish Jr.(i), Chevrolet, 194.458 mph. 36. (46) Michael Annett, Chevrolet, 192.838 mph. 37. (98) Cole Whitt, Chevrolet, 192.072 mph. 38. (30) Josh Wise, Chevrolet, 191.939 mph. 39. (55) Reed Sorenson, Chevrolet, 188.966 mph. 40. (32) Jeffrey Earnhardt #, Ford, 0.000 mph.